"New technologies do not erase the enduring strengths of magazines to build brands, to tell powerful narratives and to define the national conversation." What makes a magazine stand out? Take a look at any rack at a bookstore and you will know - its cover. Of course, it's not about the image itself, it's about the story the image (and layout) convey. These covers are designed to tell a very specific story, yet they leave themselves open to your interpretation and participation. The simpler, the more complex the narrative they symbolize. If I had to take an educated guess, I'd say that the most powerful covers (and narratives) are the brainchild of one visionary, or the collaboration of a team of specialized professionals each complementing and building upon - and not stifling - the other. This also applies to your corporate brochures, Web sites, tech sheets, presentations, speeches, memos, letters. Do you want to stand out? Then stand up and make a bold move. Outstanding is the opposite of conforming. Yes, I have seen those readers. 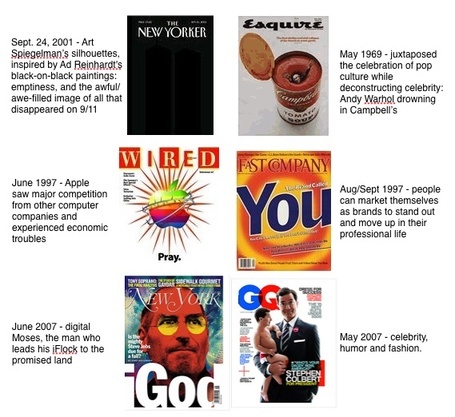 Fast Company experimented with one, too when John Byrne was still there. There is something about the sensory experience of holding a piece of paper that no online program will ever replace. Tactile, olfactory, engaging more senses than just vision. Online could add sound. We learn through tactile more than we suspect. We are we sometimes bad to the things/people we love? Thank you for adding to the conversation. You've touched on two topics near and dear to my heart. I love magazines and magazine design. They have a way to connect the other media don't. But I wonder if their days are numbered? Paper and ink is not the most environmentally friendly way of communicating. I'd like to see magazines thinking of immersive ways of connecting online. Viv magazine has made a start - distributed through the Zinio reader. Why are the things we love sometimes bad for us? @Mariana - there have been many great magazine covers over the years. The same is true for some brochures. Centre Re had a fabulous cover on their 10-year anniversary brochure. It depicted an eye that changed from close to open and had the title: "See, Saw". Simple and memorable. @Steve - Fast Company has had some of the best covers I have seen around. Fresh, compelling, and different not for the sake of it - to set a new tone, which they did for years. Time has had some interesting covers, too.